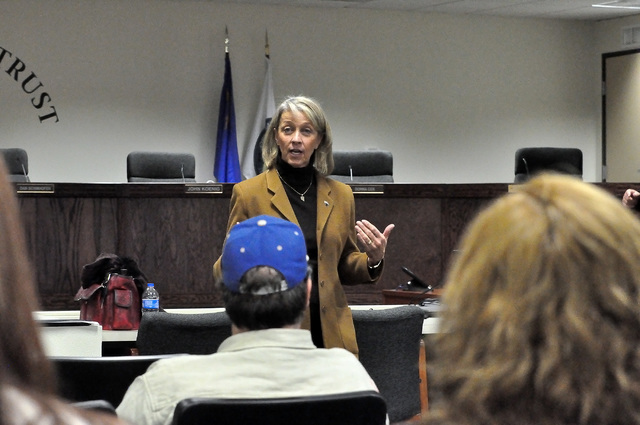 Nevada Secretary of State Barbara Cegavske stopped in Pahrump on Jan. 20 to talk about voter registration fraud. Horace Langford Jr. / Pahrump Valley Times - Nevada Secretary of State Barbara Cegavske answering questions from the audience during her visit to Pahrump. Cegavske said she goes around the state to learn from county clerks if any fraudulent forms have been entered into the system. “The registration forms are being fraudulently applied (for) and they do it under perjury of law, so that’s what’s going on in the state and that’s what we are trying to clean up,” Cegavske said to a small crowd at the Nye County Commission ChambersFriday. Prior to the last year’s election, Cegavske’s office worked with Nevada county clerks to make sure the equipment could withstand the election. She said everything went smoothly, with the exception of voter registration fraud that she had seen. Tina Marie Parks from Pahrump was arrested in July by the Election Integrity Task Force on 11 felony charges related to violating election laws. Initial charges ranged from intimidation of voters to perjury. Parks is scheduled for a sentencing hearing on March 17. The Nevada Secretary of State office submitted a Bill Draft Request to ensure that participants in voter registration are trained and certified. The bill expected to be considered during this year’s Legislative session. 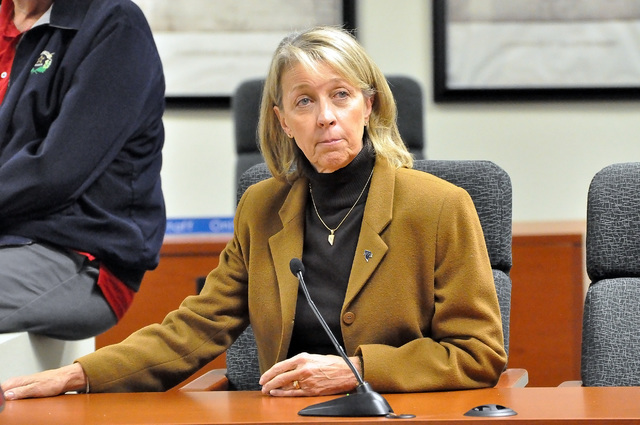 The idea has received bi-partisan support in the Nevada Legislature, she added. Cegavske said that her office is currently designing classes so clerks around the state will be retrained to give education on voter registration. “We are looking at possibly having something online, but mostly everything will be in person and you get it from the clerks themselves,” she said. “I just think it’s a great way for us to go, you can’t come into our state unless you had the training. You can’t collect signatures or have the forms filled out. So, I think that will help us a lot,” she said. Cegavske also said her office issued some warnings for those who were gathering signatures and didn’t know about a 100-feet rule at the election centers.